If you have a dream about ashes, you may be wondering what it means to see ashes in a dream. Learning to understand what this means when it comes up in a dream or other instance in life can give you a lot of insight on different things that may be happening. When you dream about ashes, the first thing to pay attention to is the context in which you are viewing the ashes. For example, if you are seeing ashes from a campfire, this could be very different than seeing ashes in place where a house or other building once stood. The item that burned can also provide clues. For example, if you dreamed of a house burning and all that remained were the ashes, you would want to understand the different meanings of a house to know what it could symbolize in your life. If you experience ash in your dream, it's also important to understand that while it may be upsetting or sad, it does not necessarily mean a bad omen. Learning about the different types of dreams can be very helpful for you to know whether this dream is precognitive or simply a release dream to help you process your thoughts and emotions from everyday life events. Observing ashes in your dream could symbolize that you are feeling disappointed concerning some change or transformation that has taken place in your life. Maybe this is a change you did not want to take place or that you felt was brought on by an external force. When we see ashes on the ground, we know that a powerful force such as a fire has happened. Because of this, it is very possible that a pile of ash could be a symbol that you are feeling as if you have lost control or lost power in a situation. You may have felt as if you had zero control and that you gad to do some sort of action you did not really want to do. You may be contemplating too much about how your life was going well, until the change and now you are feeling depressed and upset. We often associate ashes with loss - loss of a loved one, loss of a pet, loss of possessions, or even loss of a part of ourselves. You may feel that the great times are over and now you are left with only the memories of the good old days. Ashes often are a symbol of the past events that may have happened in our lives. This dream symbol often shows that you are focusing a great deal on the past. It may be time for you to start considering about the present moment and letting go of the events that happened in the past. 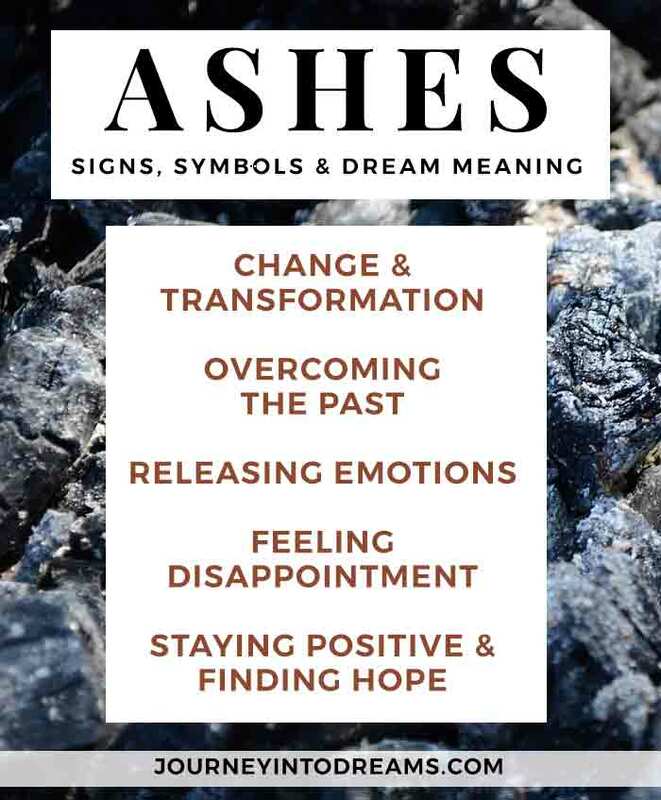 If you are dreaming about ashes, it often implies that you need to begin looking towards the future and stop concentrating so much on the events that took place in the past. The ashes show it is time to move forward from the changes that happened in your life. Once you are able to move forward, you will soon be on the path to experiencing more peace and joy on a daily basis. If you are cleaning up ashes in your dream, this could represent you are really feeling unhappy with various details of your life. You may feel like there is some aspect in your life is messy and neglected. You might feel as if you are trapped. Cleaning in a dream often means you wish to improve a situation, but are not sure how to make it better. An ash tray is where the ashes from cigarettes and smoking are collected. An ash tray could be a symbol of needing to come clean or to give up a bad habit you might have in your life. If you are not currently a smoker, it could be a representation of something that you do not like that is present in your waking life. In addition to ;earning about the symbols of ashes, you may wish to look at other related dream symbols. Looking up the different meanings of different people and objects in your dreams can give you further insight and understanding of how this dream relates to your daily every day life. Have you had a dream about ashes? What were your thoughts on what the dream might mean? If you have any dream experiences about ashes you would like to share, please tell us about them in the comments below! I had a dream I had a handful of ashesfr a fire in my left hand . My cat was eatingthe ashes out of my hand. Thoughts ? Interpretations? I had a dream I had a handful of ashes from a fire in my left hand . My cat was eatingthe ashes out of my hand. Thoughts ? Interpretations? I had a dream that my family home set on fire and my children were crying saying its all ashes and me and my partner were telling them it’s OK. Interpretations?